I just recently got back from a quick weekend trip to Washington D.C. to see the boyfriend. He’s been working up there since August, and since he’s been back to visit me so many times, I’ve been determined to see him up there, if only for another chance to visit D.C. again. (Just kidding, babe.) I haven’t been to the city since I was in high school, and before that, since I was 11. Each time has been so different, and as I’ve gotten older, I’ve been better able to appreciate just how much information is available in the Smithsonian’s, and how important it is to stand in awe at and understand all the history our country’s capital has to offer. 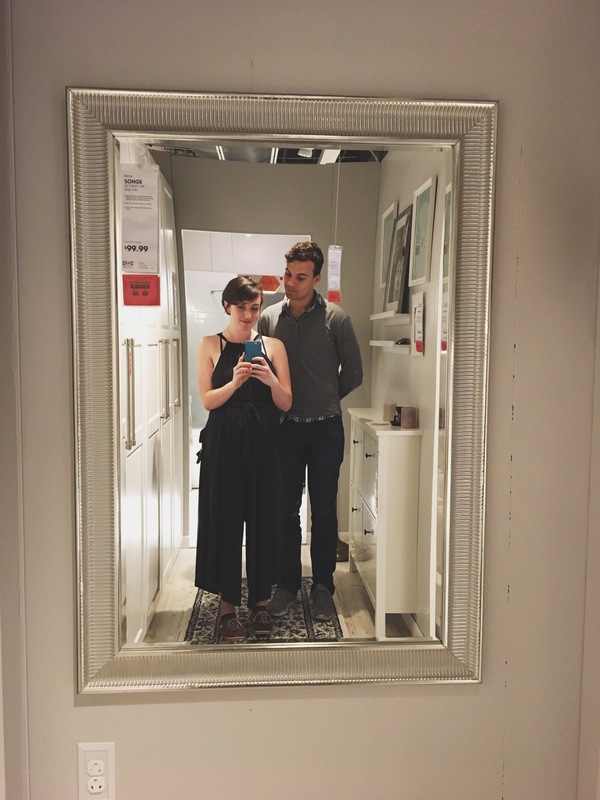 We spent the first day wandering around IKEA because it rained all day, and holy cow! I didn’t know I needed that place in my life. I contained my usual impulse shopping to a minimum and managed to only walk out with 4 cereal bowls and 2 dish towels. Next, we sipped on some coffee at the boyfriend’s local coffee haunt, Vigilante Coffee. We also walked into a local printmaking shop where I was able to purchase a beautiful piece of art to add to my ever-growing collection. Because the rain never relented, we enjoyed the rest of the evening watching movies and consuming copious amounts of popcorn. We spent all day Sunday in downtown D.C. walking around. 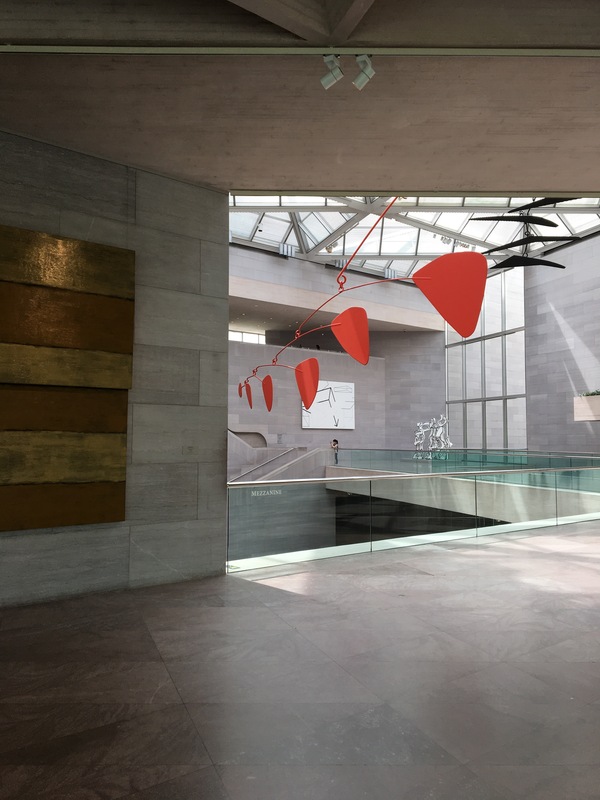 After stopping for our first cup of coffee of the day, we walked to the Smithsonian American Art Museum, where we were greeted by Alexander Calder’s mobiles suspended beneath an enormous glass ceiling. Some of my favorite pieces I saw were the Georgia O’Keefe paintings on the first floor, Louise Bourgeois’ Germinal sculpture, Klimt’s Baby (Cradle), and Leon Berkowitz’s Coronation. There was also a Frédéric Bazille exhibit on the bottom floor that took my breath away. I wasn’t allowed to take a picture of one of my favorites (Young Woman with Lowered Eyes) in that collection, so here’s the link. Our next stop of the day was the National Museum of the American Indian. I wish we had been able to spend more time in this one because it had a very thoughtfully designed exhibit that attempted to touch on all the regions in which Native Americans live. (An an Anthropology major, I found this fascinating.) Each of these exhibits expressed the same truth: the survival of culture depends on the passsage of traditions from one generation to the next. Native spiritual values live in stories. Passed verbally from generation to generation, the stories preserve Native culture, languages, and ways of explaining the universe. There was also an exhibit on British imperialism in the Americas during the time of colonization. It juxtaposed the Native American viewpoint with the British viewpoint in a way that made for one powerful presentation. After a lunch break at Union Station, and a long walk through the Botanical Gardens, we decided to head back into Maryland. However, the metro turned out to be a fiasco that evening (I’ll save that story for another time), so we wound up eating dinner at this neat place called Busboys and Poets that serves organic food in recipes from all over the world. There was also a book store right in the restaurant that offers a really interesting collection of books to encourage political and social conversations. I, of course, couldn’t leave without buying something. Being away on vacation seems to wear me out more than just a regular week at home. I’m not sure why that is. But I’m so glad I got to spend this weekend with my favorite person, so I won’t complain. I lived in a dorm room for the first two years of college, and I had way too many things to actually fit inside said dorm room, but I was too stubborn to leave anything at home. So most of my childhood bedroom and all of my Pinterest DIY’s came with me. This led to an enormous organizational issue that I’m sure my freshman roommate judged me for, and even though we had to share a room, she was kind enough to pretend that I was not actually a borderline hoarder. All I had to contain my possessions was a desk with three drawers, a dresser also with three drawers, and a wardrobe with two shelves and a small hanging rack. Grumpy: What do you have to do tonight? Erika: Well, I gotta go do some homework tonight and clean my room a little bit more. It’s kind of a mess. G: It’s not very big, don’t take too long. E: No it shouldn’t, but I have to find places to put things. Because I don’t have a lot of places to put things. G: Maybe you need some shelves. E: Well I don’t know where I would put them. I can’t drill into the wall or anything. E: But I’d have to pay for that at the end of the year. G: No, you won’t. Just tell them, “It was here when I come here.” Just tell them you don’t know where it came from. Flash forward a few days later, and my grandpa arrives at my dorm to measure the wardrobe because he’s going to build me another shelf. He pulls out his measuring tape, takes a few notes, and then is gone almost as soon as he gets there. A couple more days go by, and he calls me to tell me he’s finished my shelf and he’ll be stopping by to install it. The shelf fits perfectly, but the studs won’t fit into the pre-made holes inside the wardrobe, so my grandpa decides that he’ll just make them bigger. By drilling more holes into the sides of the wardrobe. With the electric drill he just happens to have in his truck. However, the cheap siding on the wardrobe splits immediately and chips off on the inside, exposing the inside of the wood. Undeterred, my grandpa continues drilling until the studs fit snugly inside, my new shelf perched safely inside my wardrobe. He steps back and admires his handiwork. I, however, see a bill in my future for damages to my dorm room. Later, I was very grateful for the new shelf, and I just painted over the damage with my art supplies and hoped that my RA would never find out. I have never been very good at taking care of plants. I’ve over-watered countless houseplants and flowers over the years and I consider myself to have a black thumb. I don’t even let myself wander into the clearance section of Home Depot’s garden department because those poor plants don’t deserve such a bad ending. This year, however, things are going to be different. A couple weeks ago, my friend Jenna and I went to Crabtree Farms‘ spring plant sale to browse through their rows and rows of herbs, vegetables, and flowers. This farm is an urban farm that encourages local involvement and offers CSA shares during their growing season. Maybe I do have a green thumb after all. My grandpa is one of the most important people in my life. He’s known as Grumpy in my family because he’s one grumpy old man. When you really know him though, you can see that he’s kind and loving and he values his family. When I went to college, I got to live in the same town as my grandpa, and I made regular visits to see him throughout the week. We’d go out for dinner, or I’d go to his house and bake him his favorite cookies, or sometimes he’d show up at my dorm room on the weekends at who-knows-what-time in the morning to show me the latest project he’d been working on. Since I graduated, I haven’t been able to see him as much I’d like (which is partly my own fault). But I recorded a few of our conversations on my phone to save for later. So I could listen to that gravelly voice full of quiet laughter and years of hard labor and decades of stories, memories, and love. We used to have a song when I was in Presbyterian Sunday school called something about “bringing in the sheaves, we will come rejoicing bringing in the sheaves.” I didn’t even know what a sheave was. And then we’d argue on what we gonna sing. Then we’d have Sunday school and everybody’d go out there and get in a fight. I feel like that’s not what you’re supposed to do in Sunday school. Well, that’s what we did in the Bonna Bell Presbyterian Sunday school. Now if the preacher liked you good, they had a big ole bell in the belfry that had a rope coming down. And if he liked you, he’d let you ring the bell. And one day he decided it was my time to ring the bell. I went to ring it, and I couldn’t reach the rope. And I didn’t get to ring the bell. Never did get to ring it. Rope was too short. We’d meet in the church building there, and we’d sing some songs, and he’d make a little bit of a sermon, and then we’d go outside, sit under the tree and we’d have a Sunday school lesson out there. Sitting under the tree. ‘Cept when it was raining, then we stayed inside. Sometimes you’d only get told about sin. And you’d start talking about stuff and I figured, well that’s stuff I liked to do! [laughs] And then I was in a dilemma, I didn’t know what to do then. I live in a really great city. I would say I’m a little biased, but I moved here last summer because I already knew it was great. But I am still constantly amazed at how wonderful it actually is. There’s a huge local scene here that values the importance of community and knows what being a neighbor means. I work at a local coffee shop, and I often see our regulars all around town. I walk down the street and pass by countless restaurants that incorporate local food sources in their fare. I pass by shops where the owners sit behind the counters and are always willing to start up conversations with you as you browse through their wares. This community finds itself located on the Tennessee River, and they have done an amazing job at creating something that feels just like home. As my friend Jenna would say, “It’s the biggest small town I’ve ever lived in.” Most importantly, this town offers an endless supply of opportunities to be involved in, and that, I think, is what makes people stay. Chattanooga’s annual film festival happened recently, and I was able to attend the Tennessee filmmakers block where the only stipulations were the film either had to be made by a Tennessean or it had to be about Tennessee in some way. I’m sure there were many entries, but in the end, only 10 films were shown. The directors ranged from amateur filmmakers with minimal equipment to old hats with Hollywood ties. Each one was different from the one before, but they were all so well done. Some were dialogue based, some visual, and some let the actual plot guide the story. There was one that had me completely captivated called Persimmon Ridge, directed by Paul Marchard. This one was 20-minute black and white film that followed a woman around her farm through the spring time. There was no speaking, but the sounds of the farm and the surrounding woods gave the film a soundtrack that brought back memories of visits to my own family’s Georgia farm. With its seemingly simple elements, it told a beautiful story of family, history, and hard work. Another was a mockumentary about a band of two whose only instruments were pillows. And they only played covers. (Get it?) This one had great comedic timing and was a light-hearted addition to the collections of films. You could just tell this film was fun to make, and the director (Sylvia Zdunek) was praised by an audience member for her comedic talent during the Q & A. A third stand-out called The Little Stage featured a forgotten building sitting on the edge of Bon Aqua, TN. Directed by Will Berry, it showcased some lost footage of Johnny Cash dating back to the 1970’s that showed the importance of this old building. The film follows the restoration of this structure from its decrepit state to its newly refurbished form as a small music hall and museum, paying homage to its former talented guests. I consider myself lucky when I think about the things I have been able to do and see since I moved here. Guys, Chattanooga is so great. The people. The mountains. The food. The coffee. Everything. I’m just so glad I get to live in a place like this. This is one my all time favorite books. Zusak is probably best known for The Book Thief (which you should also read! ), but this book deserves attention all its own. It follows a 19 year old cab driver named Ed who unwittingly stops a bank robbery and then begins to receive playing cards in the mail. Always aces, with clues written on them. He goes through a journey of self-discovery (blah blah), and he learns that the world is much bigger, more broken, and much more beautiful than he imagined. But what really kept me around was the writing. Zusak has this way with words that brings a poetic edge to everything he writes, and it paints the most beautiful pictures in my head. This one really caught me off guard. I am a huge fan of Gaiman as a writer and as a person. I follow him on different social media platforms, and he comes across as a very calm, genuine, and relatable person. And I’ve been meaning to pick up some of his books for a long time now, but you know how that goes. Anyway, I started with his novel Neverwhere, but I was a little unimpressed. Not that it was bad. I just had built up what I thought Gaiman was in my head. And believe me when I tell you that American Gods went above and beyond the image I created. This novel is about a man named Shadow, an ex-con and widower, recently released from jail, who is whisked away by the mysterious Mr. Wednesday on a road trip through the backroads of America to collect all of the old gods that have been pushed aside by the new (TV, Media). Exciting, thrilling, and dark, you will not be disappointed in this pick. This one. It gives me chills thinking about how relevant this book has become in the past few years. I read this one for the first time about 3 years ago now, and it gave me so much to think about. The Handmaid’s Tale comes across as a cautionary tale about what it means to give up our rights as women and what can be taken away from us so easily. It’s set in the (not so distant?) future where women have become infertile and those who can bear children are forced to become vessels for the rich to procreate. It follows the story of one handmaid in particular and her daily struggle to remain alive and well in a world that is so decidedly anti-woman and anti-choice. I think it’s an important book for everyone to read, not just women. I am not generally one for post-apocalyptic novels. There have been and continue to be so many of them, they all start to blend together for me. However, I was drawn to Station Eleven because it placed its focus on something more than just a group of survivors. There are several story lines from different time lines that don’t seem very cohesive, but they form a tangled web that slowly make sense as the story progresses. And the point of the novel is something greater than survival because “survival is insufficient.” It’s about how humanity needs something to live for in order to truly be human, be it art, religion, or a simple belief. Donna Tartt has quickly become one of my favorite writers. I read one quote from this novel online once, and I was hooked. It’s a hefty read, but the world she creates is imaginative and dark and so gorgeous. The Goldfinch is the story of a boy whose life is torn apart by tragedy and misfortune and neglectful guardians, and he quickly slips into the world of drugs, antiques, and art forgery. Her writing is beautiful, and her characters are terrifically complex. I highly recommend picking this book up from your local book store. Memories are powerful. They help us cope with loss and tragedy. They give us new perspectives as we dwell on old ones. They bring us comfort when we’re at the lowest of our lows. But they can also overwhelm us and drown us in emotions we aren’t prepared to feel yet. Memories are beautiful. Memories are unkind. Memories are human. I was 3 years old, playing on the sidewalk outside my sister’s pre-school. My mom was standing a few yards away talking to the other parents. And I was watching the roly-poly bugs curl and uncurl on the concrete as my fingers chased them around. I was 6 years old, sitting quietly at my desk, observing the new girl looking nervous in her mom and dad’s shadow. The teacher ushered her over and offered her the seat next to mine because we were both wearing shirts of the same green hue. I was 8 years old, visiting my grandparents for a week over the summer. My grandmother packed my sister and me into her old Cadillac and we drove into town, listening to the country music station, headed for the local pharmacy. She would always treat to a milkshake at the lunch counter there, and I thought I was so clever for mixing the peanut butter and fudge flavors into the most delicious combination. I was 19 years old, sitting in the cab of my grandfather’s truck. His voice kind. His face unsure. His words telling me my dad was gone. I am completely made of memories. I am stitched together from love, joy, regret, and hope. I am a quilt of the things I have done, the things I am doing, and the things I will do. Memories become shiny with sentiment and rosy with the passing of time. Memories are raw with emotions and dusty with neglect. Each memory is a flower. And together, they make up a garden through which I can walk forever. So I read this book called The Life Changing Magic of Tidying Up by Marie Kondo. You’ve probably heard of it (especially if you watched the Gilmore Girls revival), and boy, did it change how I looked at the things that I own. The essential message of the book is: if it doesn’t bring you joy, let it go. If something has fulfilled its purpose for you, then you let it go. I first read it a year ago now, and I gave away 6 trash bags bursting with clothes in a single day, and I’m a Taurus, which means I just really like things. Clothes. Books. Trinkets. Decorations. Everything. That, mixed with a splash of nostalgia, means I can’t get rid of anything. I don’t know about you, but when I was little, I thought cleaning my room just meant putting things out of sight. I never learned how to purge the things I didn’t need or want anymore. I would dread cleaning day because it would take me hours and hours just to find a place to put every single toy or book or t-shirt. I literally broke the drawers on my dresser because I had too many clothes that I didn’t even wear. I just didn’t know how to give things away. Needless to say, I am a terribly unorganized person. So much so, that when I was in 3rd grade, my teacher thought I would benefit from “PAC.” From what I can remember, this stood for “Personal Accountability Class,” and it was for the students who had trouble focusing or behaving: essentially, the bad kids. Shy, introverted Erika did not belong here, but she had no choice. I sat through several group-building activities that were supposed to test our focus but only tested my patience. Did this help my organization skills? Nope. In 6th grade, I had a zip-up binder that I lovingly filled with dividers and pocket folders and an agenda I was determined to use. I had dreams about recording my assignments in the calendar with color-coordinated pens, keeping track of all my homework with the color-coded folders. I imagined myself thumbing through the dividers to the right spot on the first try. I had dreams, people. A few weeks into the school year, I couldn’t even fully unzip the thing because I had jammed it full of papers. The only way to access anything was to unzip the top, fumble around for a few minutes, and hope for the best. I am constantly stuck in limbo between remembering and forgetting. Forgiveness and regret. The forgetting brings temporary peace. And the remembering brings the dull, lingering ache. But I know that I can keep going because I have loved and been loved. I have had and lost. I have accepted and forgiven. And I have done the hardest thing of all: I took the pain and let it make me kinder.